CD review: "... en Duo"
This is the album that Alison Kraus' and Robert Plant's "Raising Sand" should have been but wasn't: two deeply heartfelt, often soaring vocalists meshing their instruments into a single voice. The irony is that Montreal's Dawn Tyler Watson and Paul Deslauriers even tackle Plant's own "Going to California," and remake it into something distinctive and wonderful. Kraus and Plant never come up with anything nearly this good on their own recently released collaboration. 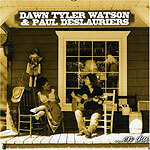 Adding further interest to this project is the fact that Watson fronts her own electric blues band with Deslauriers as her regular lead guitarist  yet they unplug here, and she moves him up front giving him equal billing on this acoustic duo outing. Zeppelin isn't even the only rock icon they remake; they also tackle W.C. Clark's "Cold Shot" (made famous by Stevie Ray Vaughan), Simon & Garfunkle's "Homeward Bound" and the Beatles "Come Together," in each case coming up with something new and fresh. It's a relaxed, easy listen throughout  the playing is never hurried, nor even particularly urgent. Rather, the intensity of the performance comes through in the emotions the two singers convey via their voices.